Today’s cards are watery (waterfall in one, ocean in the other), making me think that emotions have been strong over the last few days. I drew three cards (situation, challenge, and advice). Situation: Reversed Eight of Chalices. 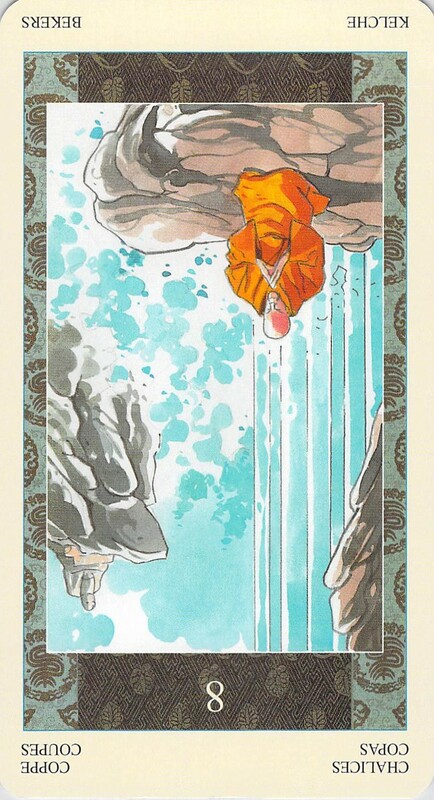 In the Samurai Deck, the Eight of Cups is represented by a monk meditating under a waterfall — a practice that helps to increase mindfulness and presence in the world. 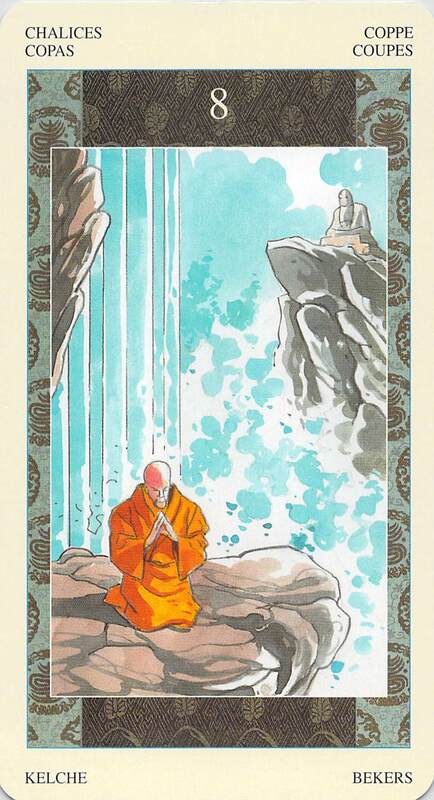 It’s often hard for people to understand why anyone would meditate under a cold waterfall. The usual assumption is that it’s a matter of developing discipline or becoming tough. But this is a misunderstanding. The point of meditating under a waterfall has more to do with learning to make peace with your situation even when there is discomfort involved — being able to be fully present and serene, and able to take a larger perspective, despite challenging personal circumstances. Do you see the difference? It’s not a matter of buckling under and forcing oneself to toughen up. It’s a matter of finding peace, comfort and serenity even amidst adversity. It’s not a practice of being tough on oneself, but rather a practice of learning to be gentle with oneself. Or put another way, it’s a matter of flowing with the energy rather than fighting it. But reversed, this energy is blocked. This card says to me that we have our work cut out for us today — and that work is to find a way to embrace our situation, and make peace with it, flowing with adverse circumstances rather than fighting them tooth and nail. How can this be done? Insight into this question will come from meditation and breathing. That sounds like a non-answer but, trust me, it isn’t. Often when we meditate during adverse circumstances, and take a strictly observational attitude toward our own thoughts and feelings, our perspective will change and we will start to stop resisting, and start to flow with the energy, suddenly seeing everything quite differently than we did before. Challenge: Reversed Nine of Pentacles. 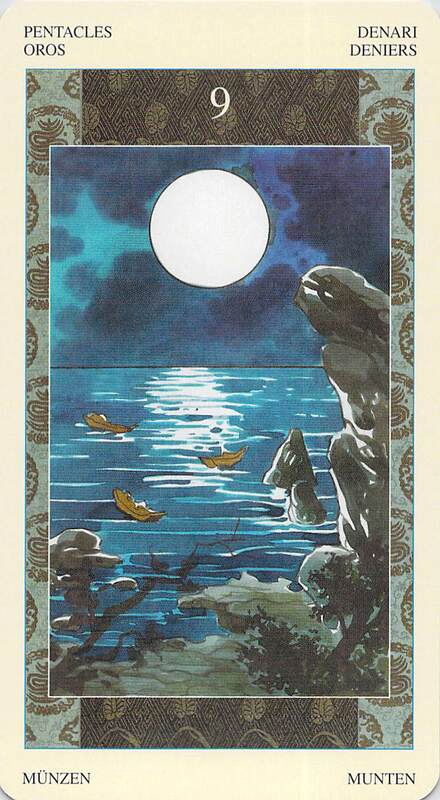 Though a traditional Rider-Waite deck shows a woman in a garden with a bird for the Nine of Pentacles card, the Samurai Tarot shows fishing boats on an ocean, at night, under a full moon. In this deck, this card is supposed to symbolize rest, and to me it’s emotional rest, rest from the stress of emotional exhaustion. With that full moon, I can’t help but connect that need for rest with psychiatric concerns such as anxiety and depression (or in some cases manic depression). And again, this card is blocked — we aren’t getting that rest, but we need it. It’s interesting that a card symbolizing rest is showing up in my challenge position. We must really need a break today! Emotional stresses are coming down on us too hard and we’ve had about enough of it. Advice: The Hanged Man. 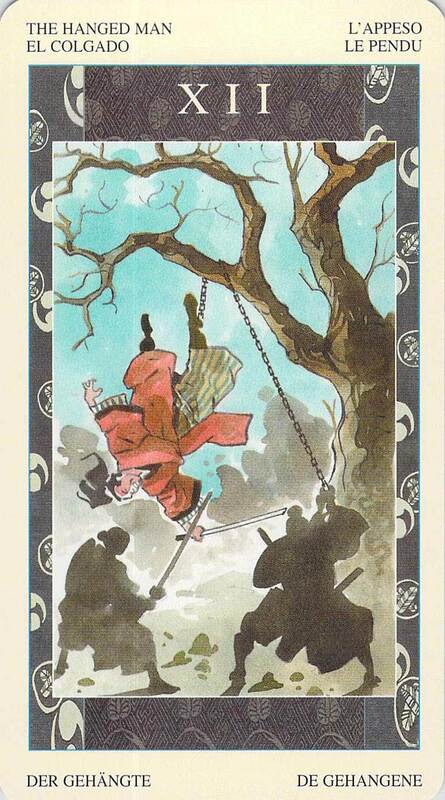 If you don’t know the story of Miyamoto Musashi, look it up in order to better understand this card (though there are many other Hanged Man stories in various cultures). As in the Eight of Chalices card above, this is a card of new perspectives and spiritual development. It has to do with learning to look at a seemingly impossible situation in an entirely new way. In a sense, this advice is to take our situation, represented by the Eight of Chalices card, and turn it right side up again. Meditate under that waterfall. Accept hanging in the tree for the sake of what it might have to teach us. And think about the illusory nature of life. It may have seemed as though we were surrounded by water and emotions, but we were really just hanging upside down in a tree. How did that happen? Or is it the other way around? Either way we are surrounded by nature; either way we have resources around us to draw on; either way there is no hurry to change anything, because discomfort can be accepted while we meditate about it and breathe into it in order to find a way to flow it into something different and new. Thanks for the comment! I am so glad that this post connected with you. Especially because it’s one of my more favorite posts, personally.